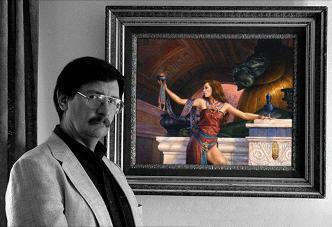 Richard Hescox is an Imaginative Realist painter whose artistic career, as an illustrator, and more recently as a fine artist creating personal paintings and commissions, has evolved towards the goal of rediscovering the forgotten esthetic sensibilities of the late 19th century fantasy painters who are his major influence. His newer works maintain the same imagination and sense of wonder as his illustrations, but without the editorial constraints of his commercial clients. His illustrations include book covers, production art on Hollywood films, and concept art on computer games. His published works include hundreds of book covers, record album covers, movie posters and magazine illustrations. His paintings have been exhibited in shows held at the Society of Illustrators in New York, the Delaware Art Museum, the Canton Museum of Art and the Allentown Art Museum. As a fine artist his goal is to create images that serve as a focal point for the imaginings of the viewers rather than depicting a specific tale. These personal paintings, featuring mythological women in mysterious and lyrical settings, have often been featured in “Spectrum” and have also been finalists in the Art Renewal Center’s annual Salon. One of the main thematic approaches of imaginative realism, practiced by artists throughout history, from cave paintings to the present, is Allegory. This is the use of a mythical human entity to symbolically represent an aspect of nature or of the human condition. Using such an entity to symbolically personify the concept, the Artist makes a connection between the aspect portrayed and the viewer that is more profound because of our ancient identification with the world of mystical beings which has always been a part of our culture and our dreams. That enhanced communication between the image and the subconscious can be a much more personal and affecting experience because it circumvents our waking mind with all of its protective barriers. Whether allegorical or not, all realistic art is attempting to represent something that it actually isn’t. It seeks to deceive the viewer into experiencing a location or incident that is not actually present. A painting of a landscape is not that place, but seeks to convince the viewer that they are there. In an allegorical work the attempt is to convey concepts that do not have a specific real appearance, such as an emotion like Temptation or a cultural concept like Science or Time. All images on richardhescox.com (as well as all artwork or portions thereof created by Richard Hescox and published in the book “The Deceiving Eye, The Art of Richard Hescox” or any other publication) are copyrighted and all rights are reserved by the artist. These images are not in the public domain. This material may not be reproduced, scanned, manipulated or circulated in any form (either for profit or non-profit purposes) without the explicit written permission of the creator. Displaying such images in any print or electronic format (including, but not limited to: web galleries, avatars, logos, tags, tubing, desktop themes, mail/message board signatures, etc…) without prior permission is a violation of international copyright laws. Dissemination of any unauthorized images (whether for profit or non-profit purposes) causes actual harm to the interests of the artist/creator. Such violations of copyright will be pursued vigorously.